Lakshadweep formerly known as the Laccadive, Minicoy, and Aminidivi Islands is a group of islands in the Laccadive Sea, 200 to 440 kilometres (120 to 270 mi) off the south western coast of India. Lakshadweep comes from Lakshadweepa, which means one hundred thousand islands their total surface area is just 32 km2 (12 sq mi). Kavaratti serves as the capital of the Union Territory and the region comes under the jurisdiction of Kerala High Court. Lakshadweep formerly known as the Laccadive, Minicoy, and Aminidivi Islands is a group of islands in the Laccadive Sea, 200 to 440 kilometers (120 to 270 mi) off the south western coast of India. 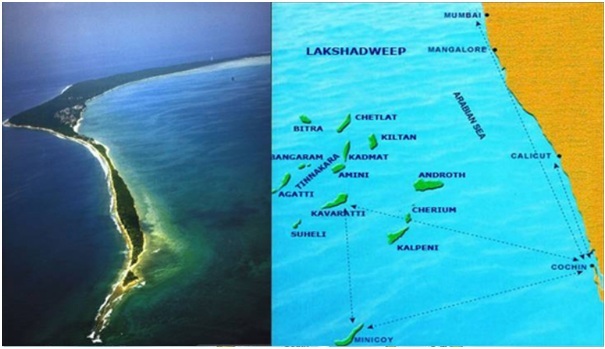 Lakshadweep comes from "Lakshadweepa", which means "one hundred thousand islands" their total surface area is just 32 km2 (12 sq. miles). Kavaratti serves as the capital of the Union Territory and the region comes under the jurisdiction of Kerala High Court. It was part of Maldives islands before it was handed over to India due to the distance between Maldives and Lakshadweep (Maliku) made it difficult to manage and provide basic necessities. In 1956, during the reorganization of Indian states, the Lakshadweep islands were organized into a separate union territory for administrative purposes. The Aminidivi subgroup of islands (consisting of Amini, Keltan, Chetlat, Kadamat, Bitra and Perumal Par) and the Laccadive subgroup of islands (comprising mainly Androth, Kalpeni, Kavaratti, Pitti and Suheli Par), both subgroups having a submarine connection between them through Pitti Bank. Together with Minicoy Island, a lonely atoll located at the southern end of the 200 km broad Nine Degree Channel, they form the Coral Islands of India in the Arabian Sea. All these islands have been built up by corals and have fringing coral reefs very close to their shores. Coconut, fibre extraction and production of fibre products are Lakshadweep's main industry. Fishing is the main livelihood of the islanders. There is an estimation of about one lakh tones of tuna and tuna like fishes and about an equal quantity of shark in the sea around Lakshadweep. Its 36 islands covering an area of 32 sq kms, only 10 are inhabitated. Androth is the largest inhabitated Island and closest to the kerala.